Long entry following some bullish price action on the H1 time frame immediately upon the next touch of 0.6992. Short entry following some bearish price action on the H1 time frame immediately upon the next touch of 0.7129. I wrote yesterday that if the price continued to move down from 0.7090, it could go all the way to at least 0.7050, so it is worth watching what happens at the current price area carefully. The long-term bearish trend could help bears a great deal here. This was a good call, at least partially, as the 0.7090 area held, and the price fell almost another 50 pips from there during yesterday’s New York session. However, we have seen a strong recovery from that low, and the price is currently testing the 0.7090 area again from below. It might act as resistance again, but I think overall this pair is better avoided unless we get a good bearish reversal at the resistance level of 0.7129. 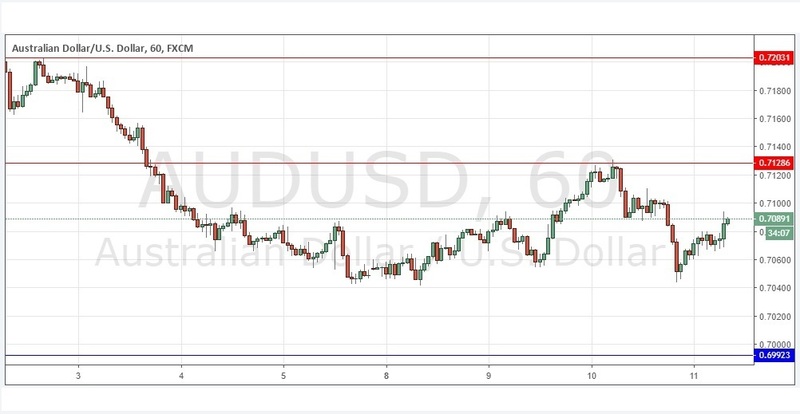 There is nothing important due today concerning the AUD. Regarding the USD, there will be a release of CPI data at 1:30pm London time.